We're just coming out of the busiest time of year for us. December was busy creating product for my new Ellabella Designs Shop, celebrating birthdays and Christmas, then New Year's! 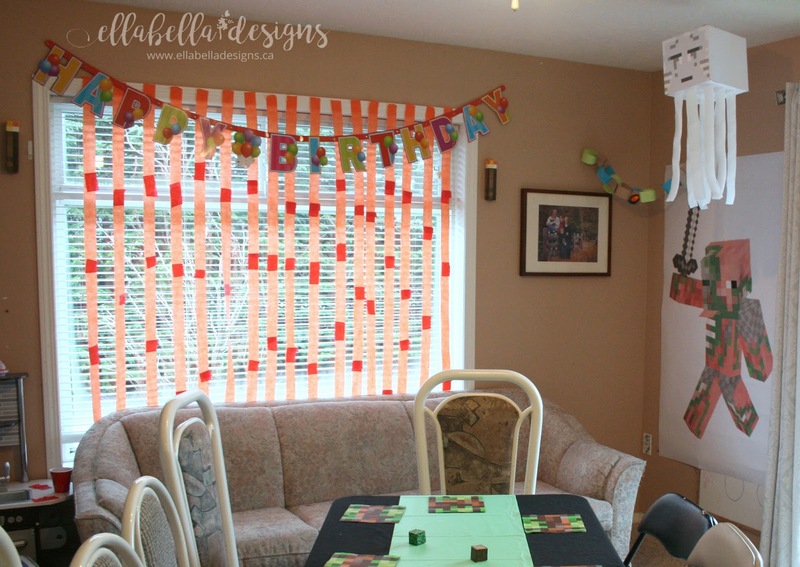 Once January hit, it was full on organizing for our two boys' birthday parties! It certainly is a crazy time of year! 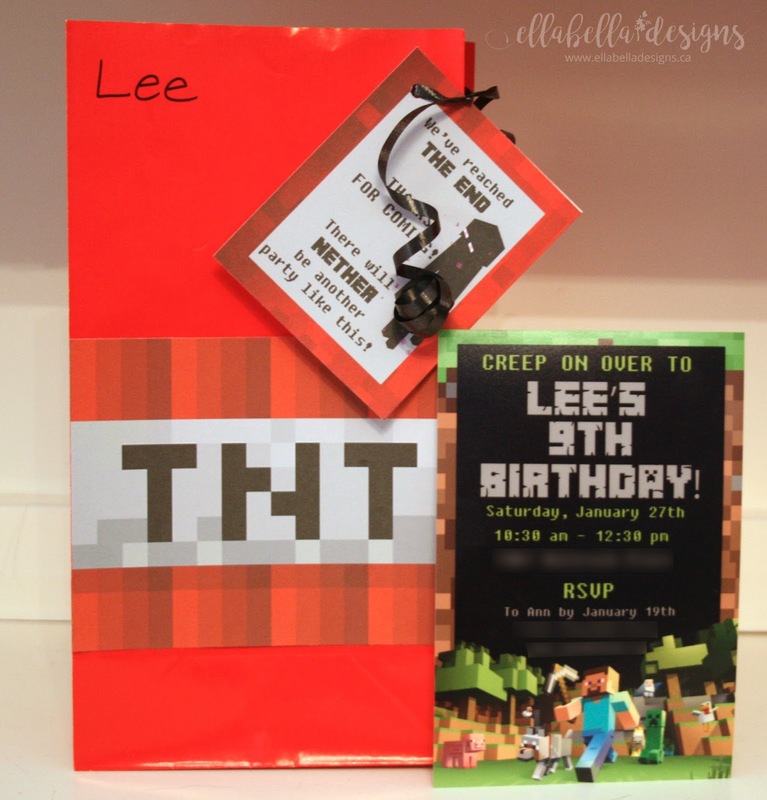 Our oldest boy, who just turned 9, is still really into Minecraft and wanted a Minecraft Birthday Party! 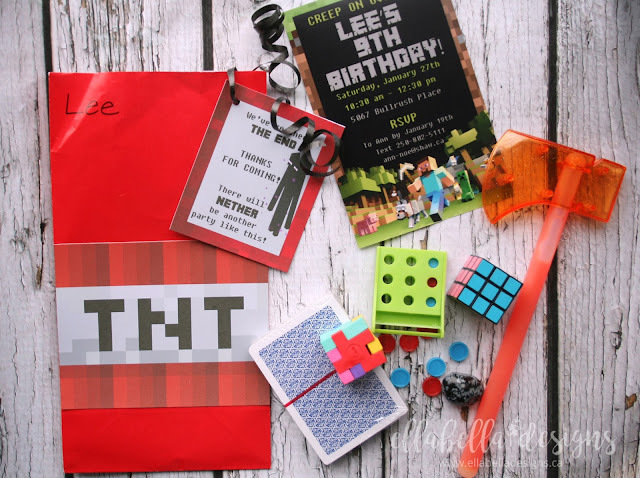 As usual, I searched the internet for some ideas then found some Minecraft clipart to use on the invitations and for decorations. I left it to my son to decide what he wanted, as I know next to nothing about Minecraft! 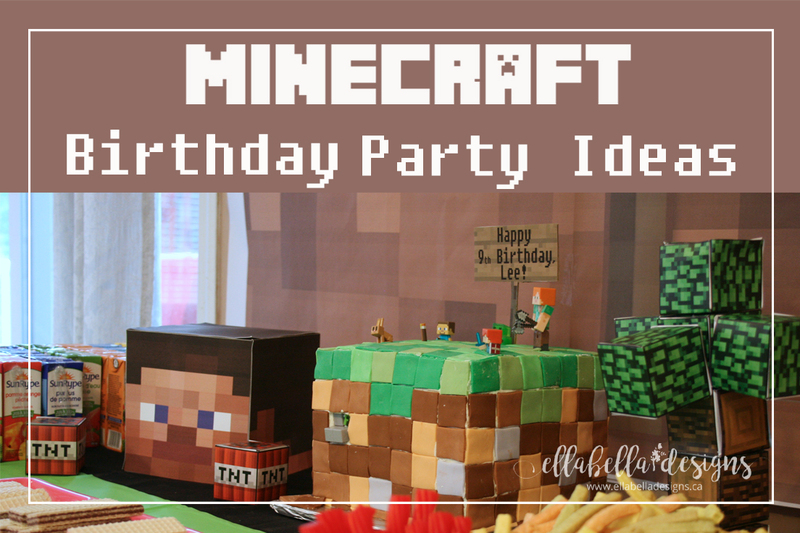 I created a Minecraft Birthday Party Board on Pinterest which was very inspiring! Be sure to check it out for more ideas! 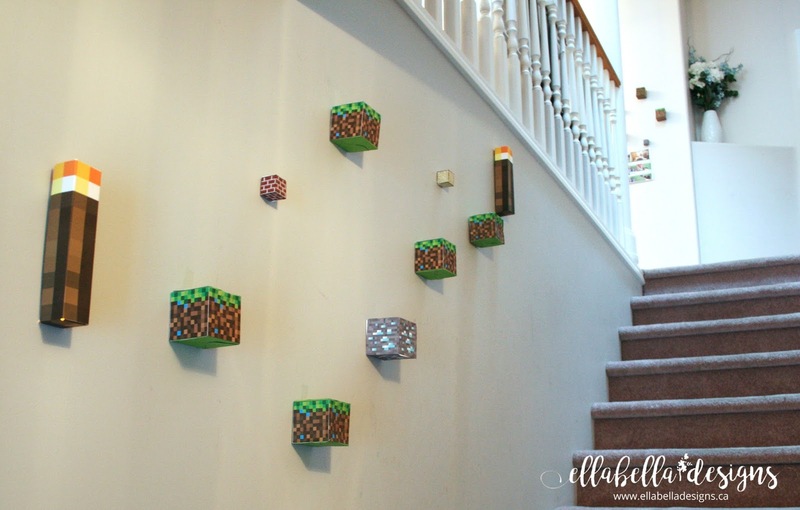 We set the scene at the entrance and attached Minecraft torches (with flameless LED tealight candles inside) and blocks on the stairway. 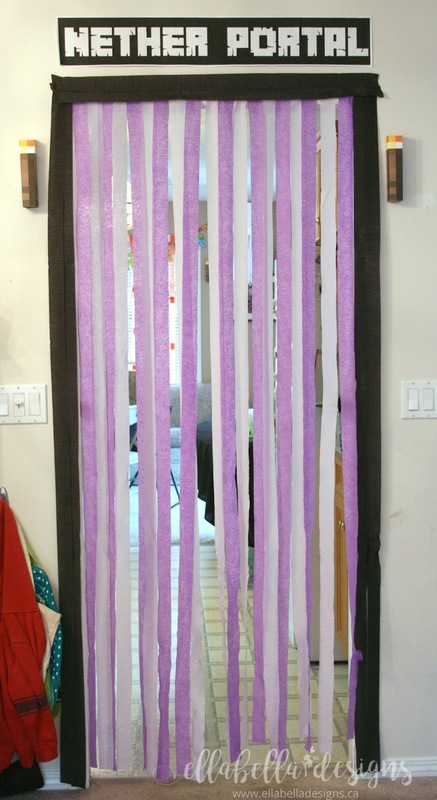 We made a Nether Portal at the entrance to the kitchen area where the food table was located. Inside the Nether Portal he wanted a lava waterfall, which we made with orange and red streamers. I also made a Ghast to hang and printed off a large Zombie Pigman for the full Nether effect! 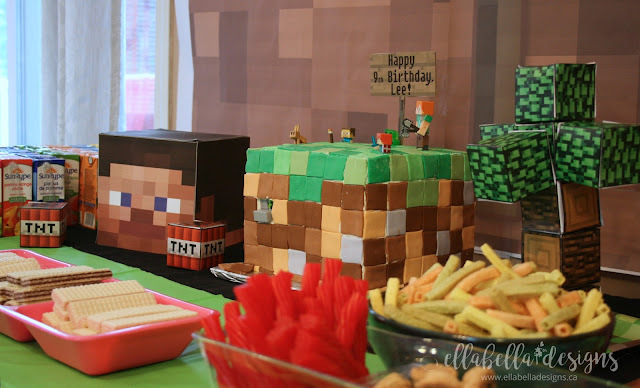 Table decor was kept very simple, using a simple black table cover with a green table runner, square plates, pixel napkins, and I added a few mini Minecraft blocks over the table. We printed off a large block with a sign for the backdrop for the food table and attached a couple of torches! 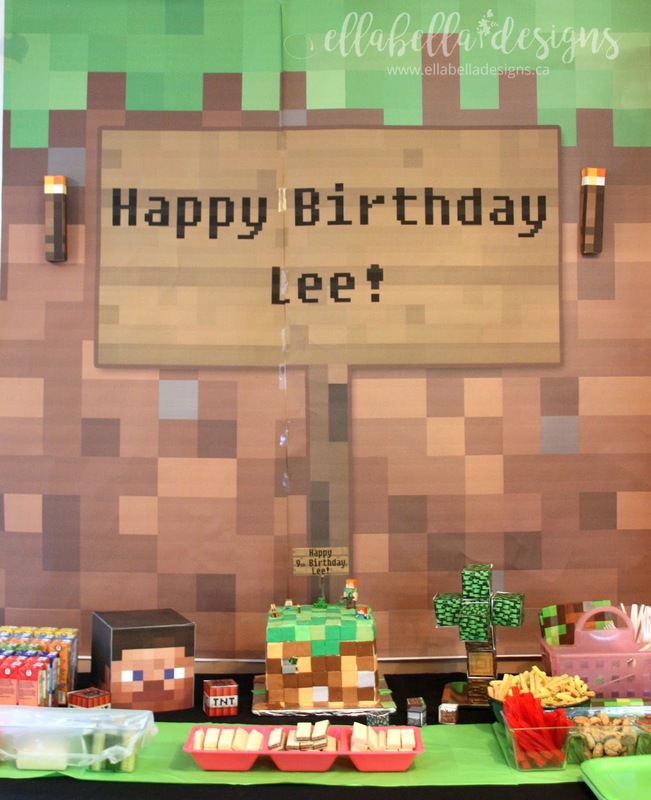 The food table was decorated with larger blocks and a printable Steve head. We had someone local make the cake for us, and he used his little mini Minecraft figurines to decorate! I printed off a mini Minecraft sign to put on the cake. We actually didn't have many games as we hired a magician, another of our son's favorite things! But I found some great ideas on Pinterest including a game I really wanted to try, Musical Minecraft Blocks, but alas, we just didn't have the time. 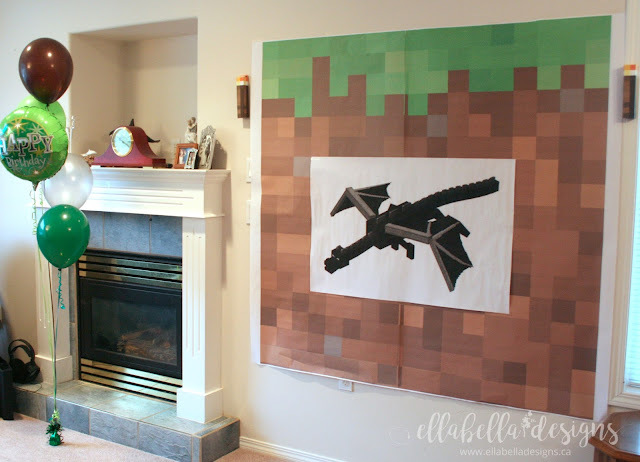 One of the must-have games he wanted was pin the tail on the Enderdragon! I printed up a large cube as a backdrop for the magician and it worked perfectly for a place to play the game. We also had a treasure hunt for eggs and hidden inside were real mined rocks and gems. At the end of the party, we had a treasure chest pinata filled with candy! I bought red bags and attached a TNT sign on the front. I made the goody bag tags and invitations using some inspiration I found on Pinterest! The kids all had a blast at the party! We had a lot of fun decorating and I think the torches were my favorite, as the flameless LED tealight candles really gave them a realistic look! They looked amazing at night! What themes have your kids had/are having for their birthday party? Comment below! 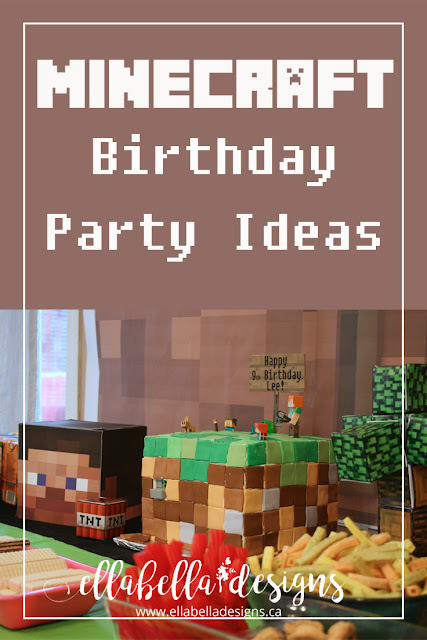 Be sure to check out all of our birthday party themes here! I'd love it if you shared this post on Pinterest!